Five photos were entered for the September competition and there was a draw, Pauline Meyers’ flower of a plant from the Caladenia hueguelii complex from Western Australia and Jill McPherson’s Plumatichilos sp. 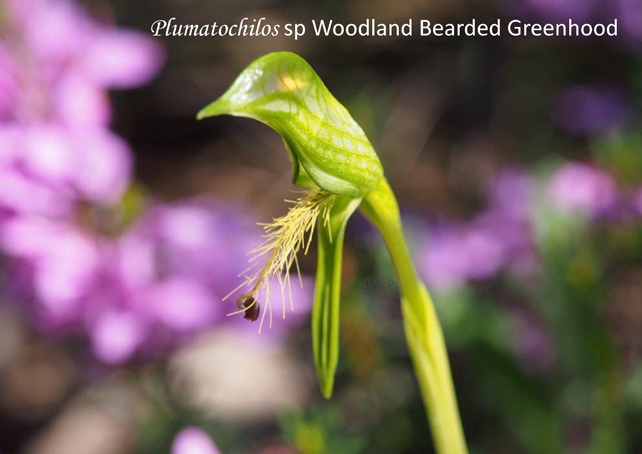 Woodland Bearded Greenhood from Scott Creek Conservation Park. The other three by Chris Davey were photographed on Yorke Peninsula (see Letter to the Editor in this September Journal). 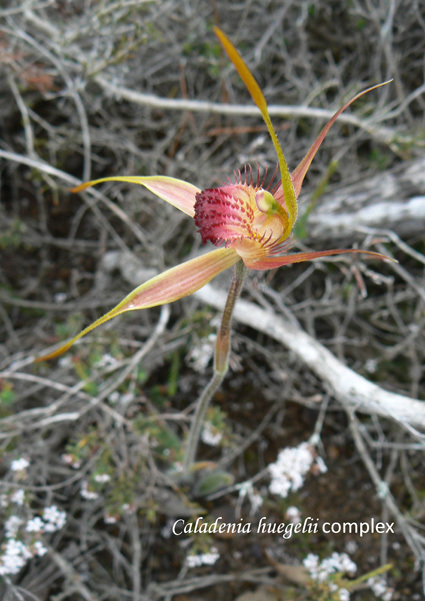 As winners they showcase the great diversity that are found in our Australian terrestrial orchids. Plumatichilos belongs to the greenhoods but the features that set it apart from the other greenhoods are the long thin bristled labellum, the galea pinched in the middle resulting in two openings and the rosette of leaves growing a short way up the stem. Nationally there are thought to be several species but only a small handful have been named. In South Australia, there may be a few distinct species but currently they are usually identified with a phrase name such as Plumatichilos sp Woodland Bearded Greenhood. Mainly flowering in spring the flowers of the Caladenia huegelii complex are characterised by the thickened clubs on the three sepals, petals shorter than the long sepals, fringed (either short or long) labellum with four or more rows of calli. All of these features can be seen in Pauline’s photograph but the leaf is not so easily seen which should be long, hairy and curve inward. In all there are said to be twenty two species within this complex of which twenty are named. Brown et al (2013) Field Guide to the Orchids of Western Australia, Floreat, WA Simon Nevill Publications. Jeans, Jeffrey & Gary Backhouse (2006) Wild Orchids of Victoria, Seaford Vic: Aquatic Photographics.